I’ve been thinking about creativity a lot these past few months. And perhaps that’s one of the reasons, I chose Creativity and Inspiration for the theme of the Write Tribe Festival of Words #4. Today’s prompt is about fear being a block to our creativity. In my post there, I’ve shared about not commiting to a great idea for the fear of failure, etc. Thinking about my own creative pursuits, it just came to me that training has been one of the most creative things I’ve done for so many years of my life. I began in small ways when I was just out of college – working with other young people. I’ve done some technical training when I worked at ANZ too, because my boss thought I had potential to train. Then I got into it in right earnest with Divya Disha, now a huge NGO, then a group of motivated young people who wanted to make a difference in people’s lives. We trained children, youth, teachers, nurses. We designed courses. We loved creating exercises and arguing over things as we brainstormed. We read. We learned from each other. We gave each other feedback. We suddenly pitched in when someone went blank. I still giggle over the time we were given really short notice to train a group of young nurses. We planned some part of the programme on our way to the venue. Then while one of us led the group in an exercise and asked them to close their eyes, the other two of us, planned the rest of the programme! The nurses loved it. No one was any the wiser! It seemed natural that I should drift into full time training then. And I enjoyed all the opportunities I got with HSBC. I think I was one of the few lucky ones to get to design a language course. I absolutely loved creating it and learned so much in the process. This lead to me setting up a small training company first with one partner and then with another. When I quit to move to Mumbai, the company was still in its fledgling stage, although we had created and trained quite a few courses. I’m happy to report that my business partner has made Metamorphosis a success. Over the last few years, I’ve got used to being a stay-at-home woman. I love writing and blogging. But I know I want to venture out more. At the start of this year, I set an intention to dare greatly. When I meant dare – I meant that I want to learn more, grow more and venture into more creative pursuits, while be authentic and simple. If there’s one thing I know about the Universe, it is how it takes our intentions seriously! It presented me with an opportunity to learn via the mindfulness workshop I attended. I discovered a totally different aspect to my creativity – intuitive painting. Something I enjoy. And now the Universe is presenting me my old love once again. Yes, I’m venturing back into training after a gap of over 8 years. Am I nervous? You bet. But I’m putting aside my fears and daring greatly because I know that just past the fear is joy of doing something I love. 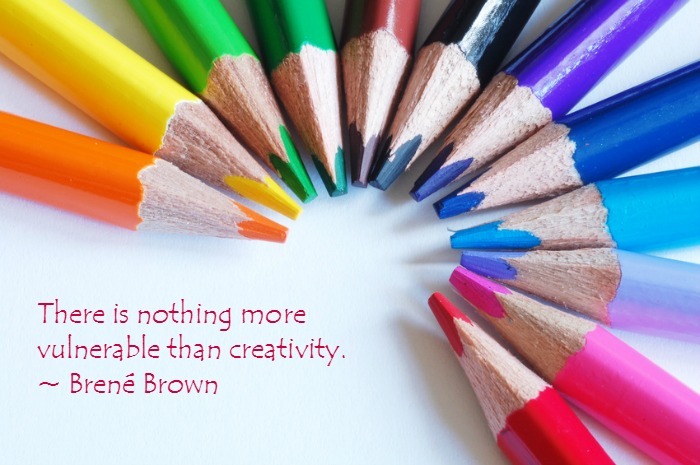 Do you hear that loud voice in your head saying “You are not creative” ? If you do, then it’s time for you to tell it to shut up! Our Contemplative Writing workshop will get you started with this and provide you tools to start writing freely and authentically. Participants from the age group of 16 upwards Writers, bloggers, non-writers – the workshop is open to anyone looking to become more aware, creative and mindful. Participants get a feel for how they can open up to their own creativity and use writing to become more mindful of happenings within and around them. Spread the word. Wish me luck! Corinne, I’d simply die without a creative outlet!! You don’t need luck – you’re already an amazingly creative woman! You will take this course and rawk it!! I expect great things from you – this is such a good post topic! It has inspired me to find ways to be more creative, too. The program sounds marvelous, Corinne! Wishing you nothing but the best and great success! I’ve seen you as a trainer in action – and I think you’re going to rock it, Corinne! Shine on! Life is too short Corinne to not do what we want to do. So, just go out and win the world. Looking forward to hear how did the session go. Enjoy! I hope we can bring this ‘show’ to Bangalore! When you take your passion and turn it into your life’s work then you are truly in alignment with the Universe and doors just open up. Wishing you every success in your venture.